More and more local communities across the globe are struggling to maintain the uniqueness of the places they live in and at the same time to balance this with their economic development. Ecotourism may serve as a tool for enhancing quality of life, increasing opportunities for environmentally responsible economic development, and conserving fragile natural resources, cultural heritage and landscapes. At the grassroots level ecotourism is a tool to foster economic development based on local resources, improve the livelihoods of local residents and at the same time strengthens cultural and social identity and sense of a place. All definitions of ecotourism underline its crucial role in supporting the well-being of local people. Ecotourism is about local communities. Ecotourism developed in parallel with other forms of sustainable tourism and in combination with healthy food production, traditional and artistic crafts and other services can be a powerful impulse for reinforcing the strategy of environmentally-friendly economic growth. First of all it brings direct economic benefits for local communities in rural areas and improves the quality of life (tourist expenditures are invested directly in the local economy). Also it actively strengthens local identity and sense of place (ecotourism is about telling stories of a place and its people). Furthermore, ecotourism empowers different generations, especially young people and women, maintaining the social equity in the region. 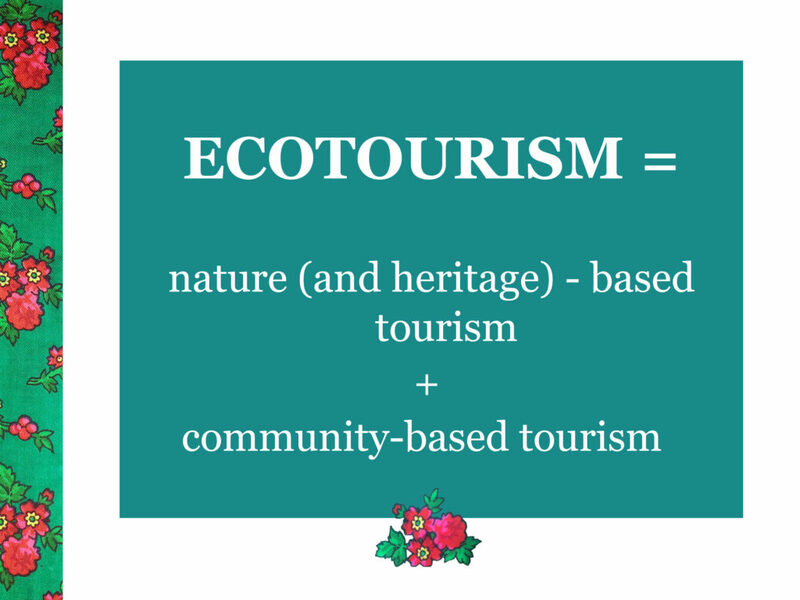 Therefore we could describe ecotourism using both parallel terms – nature (and heritage) -based tourism as well as community-based tourism. 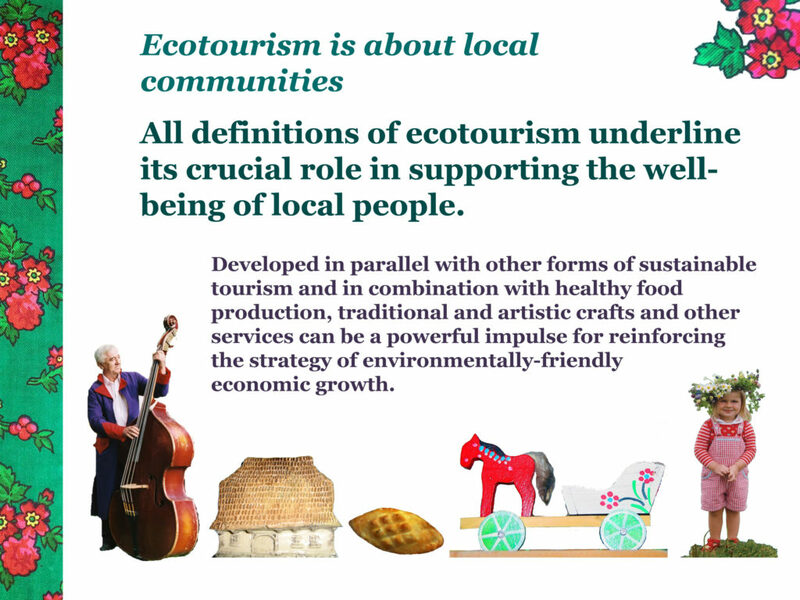 The World Tourism Organization (UNWTO) identifies several important characteristics of ecotourism related to its social dimension (see below). Richard Denman (UK) in a report published by WWF International recognizes that ecotourism is community-based tourism “where the local community has substantial control over, and involvement in, its development and management, and a major proportion of the benefits remain within the community”. Increasing local and visitor awareness of conservation. Source: Denman Richard, “Guidelines for Community-based Ecotourism Development”, WWF International, 2001, The Tourist Company. It is essential to refer to the special role of ecotourism in protected areas and their buffer zones. Economic objectives deal with building the case for sustainable economic development in the most fragile, pristine and valuable regions of the world, which helps boost the national economy, tackle unemployment and raise funds for nature and landscape protection. Town and local government authorities lying within the boundaries or in buffer zones surrounding protected areas increasingly see the benefits for the local economy and community that come from making the most of being in a unique location. According to the World Council of Protected Areas of the IUCN, protected areas as the basic tools essential for protecting biodiversity cannot be run in isolation from regional development strategies and broader policies supporting sustainable development and spatial development that impact regions where these areas are located. Managing protected spaces has to go hand in hand with creating opportunities for and meeting the needs of local communities and the society at large, which benefits indirectly from the existence of legally protected areas. It is the core idea of the document called “Parks for Life” (see below). In 1994 the World Council of Protected Areas of the IUCN (International Union for the Conservation of Nature) developed an action plan for protected areas in Europe called “Parks for Life”. The action plan, which was founded on the premise that protected areas can only properly function if their management is tied and interlinked with regional, national and international socio-economic and political developments. In the first part of the „Parks for Life” publication, one can read about the important piece of the puzzle represented by ecotourism, because it is this form of tourism which offers „tangible benefits, if sensibly developed on or near protected areas, especially since it embraces widely recognized natural and cultural values. A healthy and attractive natural environment is essential for the sustainability in the long-term of any form of tourism”. When we speak about community-based ecotourism it is important to mention its role in strengthening social equity, especially in so far as it empowers women. Ecotourism is a brilliant opportunity for women to grow both professionally and personally, while remaining a part of the local community where they live and work. Ecotourism can empower women in many ways. Its multidisciplinary concept can engage women with different skills, interests and passions. Working in an ecotourism setting can be an important added value to everyday life. Ecotourism is based on local resources, heritage, uniqueness of a place. That is why it allows women to find the sustainable livelihood that brings not only the economic benefits but also the joie de vivre and satisfaction. Ecotourism also links women with the place they live, which benefits the whole community and all its generations. Women are very often the natural leaders in their local society, they are very sensitive to the issues related to the environment, society, heritage, and sense of place. Ecotourism in a broad context, connected with other activities (such as sustainable farming, handicraft, art, education, etc. ), can provide opportunities for women to find a sustainable way of living. Participation of women in the development of sustainable tourism industry at the local level is very diverse – from running accommodation services, cafes, restaurants, and shops, to working with handicraft, art and food processing, guiding and interpretation. Apart from running small businesses, many are involved in tourism development while working for cultural centers, municipalities, NGOs, and schools. Ecotourism can be a perfect tool to initiate women’s active participation in sustainable community development. Building international networks and projects is one of the best ways to overcome the challenges that women encounter, as it allows them to have access to more information, as well as the opportunity to show their work to broader audiences outside their local community. Sustainable tourism, including ecotourism and heritage tourism, can mobilize local communities – encouraging enterprise, creating green jobs and additional revenue streams, restoring and protecting traditional vocations and styles of life. The aim is to improve the livelihoods of local residents, spreading the principles and support for sustainable tourism and making sure that various groups in the community and society at large can reap the benefits. Promoting local products, art, handicraft and local traditions; landscape stewardship initiatives preserving the unique natural heritage; creating educational farms, thematic villages and festivals; building an offer based on storytelling and poetry, folk culture, music and deliciously varied cuisine – these are just a few of the many examples and creative ideas on how ecotourism, implemented in synergy with other forms of entrepreneurship in rural areas, can involve and support local communities while contributing to long-term economic development. Several examples below explain how local communities across Central and Eastern Europe (CEE) over last two decades have been trying to link sustainable tourism development with protection of the uniqueness of the places where they live. Case studies of community-based initiatives illustrate the grassroots movement based on cross-sector partnership of community leaders, NGOs, governments, entrepreneurs, schools, cultural centres, protected areas administrations and other stakeholders. Northeastern Poland may be viewed as the “cradle” of Polish ecotourism, with the Podlasie White Stork Trail as a magnificent example of a supra-regional ecotourism product. The 412.15 km long heritage trail, which forms part of the Greenways routes, links four spectacular national parks (Białowieża, Narew, Biebrza and Wigry NP) and is distinguished by the huge stork populations nesting in the valleys of the Narew and Biebrza rivers as well as over 270 other species of wetland birds. The idea behind the trail is to build a cross-sector partnership between the tourism sector (agrotourism farms, local restaurants, travel and active tourism agencies), local governments, NGOs and administration of protected areas in order to build the ecotourism and active tourism offer based not only on the well-known attractions presented in and around protected areas but especially on the heritage of small (undiscovered) towns and villages outside main tourism destinations. The trail’s main axis is marked as a bicycle route, but in many places it is also possible to rent kayaks, swim a traditional row boat (called “pychówka”), ride on horseback or watch and take pictures of birds and other animals (such as elk, beavers etc.). The heart of the trail is in the European Stork Village – Pentowo, where as many as 36 occupied stork nests can be found in a single agrotourism farm with a hundred-year-old wooden manor house on the bank of the Narew river. (more: http://www.podlaskiszlakbociani.pl/en). In 2000, local partnership group from southeastern Poland (Bieszczady Mountains) started a program called Green Bicycle in order to support local community green tourism and heritage initiatives around the Eastern Carpathians Biosphere Reserve. The project was a vehicle for activating local people and entrepreneurs to build a sustainable brand of the region and animate small centers and villages in the Carpathians outside the the Bieszczady National Park (main tourism destination). One of many successful examples is the village of Uherce Mineralne located far from main tourism routes. Brave and imaginative local entrepreneur (owner of the art-eco farm and hotel, Janusz Demkowicz) – thanks to the strong support of local municipality – started the project on railroad bikes that were created on the unused railway track – line no 108. The old railway building was renovated and turned into a cultural center and railroad bikes rental. The project animates and continues to animate and inspire other forms of local community entrepreneurship – such as cafes, open-air bars and souvenir shops around the railway. (more: http://drezynyrowerowe.pl). Rolling hills with patchworks of fields, vineyards and orchards, picturesque streets lined with historical wine cellars, quaint villages and small towns with a vibrant musical heritage, especially the music of cymbals and fiddles, wine festivals and unending wine tasting at local wineries. There are over 10,000 family-owned wineries in the Southern Moravia region. Thanks to the initiative of environmental NGO – Nadace Partnerstvi – the region became the model example of a sustainable tourism destination in Central and Eastern Europe. This initiative began in 1999 as a collaborative effort on the part of 280 wine towns & villages led by environmental NGO (main leaders were a tandem of the mayor of Vlkos village Anna Carkova and Greenways Manager Juraj Flamik). They started by creating the network of 18 wine routes and building quality products around them combined with professional marketing strategy. 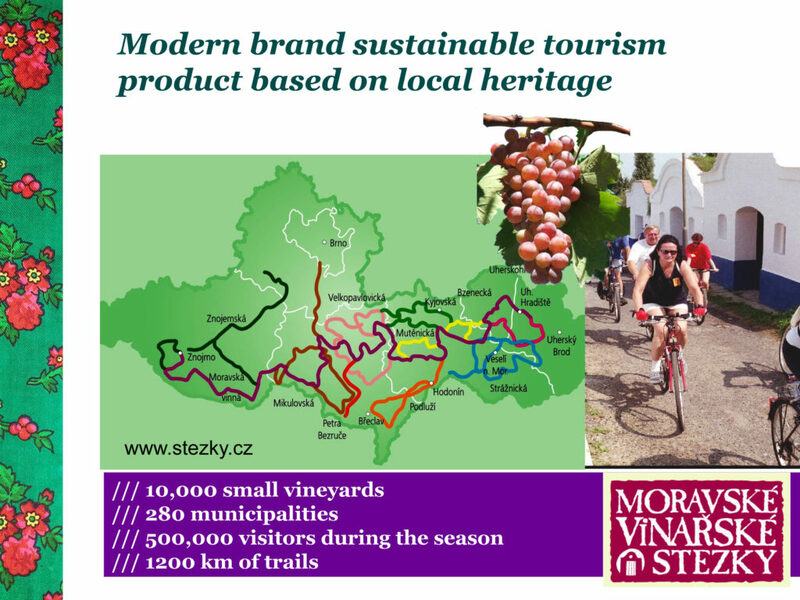 At the height of the season, half a million tourists a year go biking on the Moravian Wine Trails, staying at family-owned B&Bs (often run by wine makers), taking part in wine tasting workshops and cultural events (concerts, festivals, handicraft workshops etc.). A major draw to the region outside the holiday season is a festival of open wine cellars, which takes place twice a year – in late autumn and early spring. (more: www.stezky.cz). Belarus is a land made for ecotourism. The Belarussian village has stayed practically unchanged over the past hundred years. More than half of the villages are hamlets with no more than 50 residents. A particularly impressive feature is the traditional wooden architecture, painted window shutters and fences, a rich and authentic folklore, but first and foremost – Slavic hospitality and Belarussian openness. 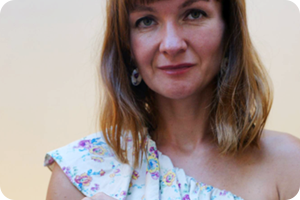 The Belorussian Association Country Escape led by Valeria Klitsounova, was founded with the express mission of building a professional ecotourism offer based on a network of family-owned guest houses from across the entire country. Today, the network consists of over 500 accommodations which offer also healthy food, heritage interpretation, art and culinary workshops, rent kayaks and organize local events and active green tourism trips. Theme villages, ecomuseums, cultural festivals are organized by local community leaders who emerged thanks to this impressive initiative (more: www.ruralbelarus.by). Most of the ecotourism community-based initiatives all around the world are still small-scale, grassroots efforts, based oftentimes on local initiatives of individual environmentally-conscious entrepreneurs, active citizen groups and NGOs, protected areas administrations or local governments who realized that only a clean natural environment may attract tourists in the long run. It is crucial to build cross-sector partnerships and quality tourism products. Community-based ecotourism initiatives should be linked to a broader strategy at the local, national and regional level. For this we need to set out national and trans-national guidelines, standards and polices for long-term development of tourism that will help balance out economic, ecological, social and spatial priorities. 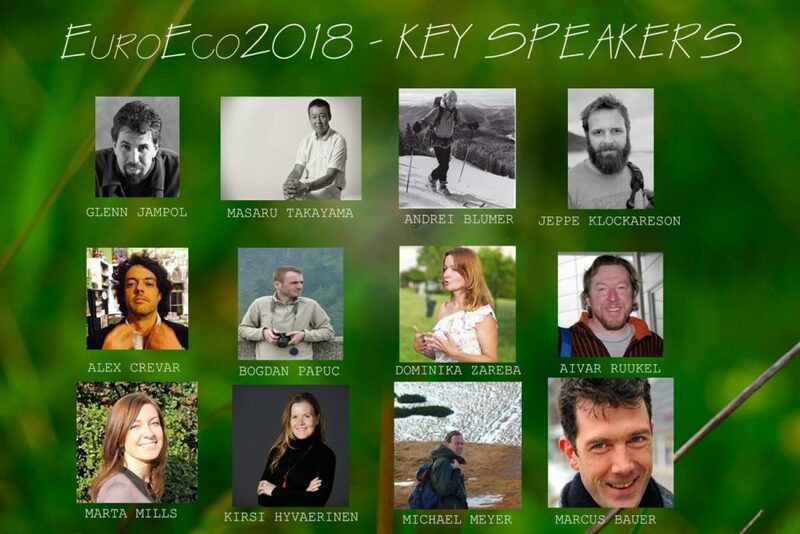 Ecotourism – implemented in synergy with other forms of sustainable tourism and entrepreneurship in rural areas – may become our important contribution to the preservation of heritage and landscapes, enhancing the quality of life as well as assuring a more equitable share of benefits among local communities across Europe and the world. Taleb Rifai, former UNWTO Secretary, once said: Sustainable tourism can contribute to combating poverty, climate change and environmental problems as well as ti supporting local communities. Your culture is your story. Travel, Enjoy, Respect… (Krakow, 3rd International Congress on Ethics and Tourism, 2017). Denman Richard, “Guidelines for Community-based Ecotourism Development”, WWF International, The Tourist Company, 2001. Whelan Tensie, ed. “Nature tourism”, Island Press, Washington 1991. Zaręba Dominika, „Ekoturystyka”, PWN, 3rd edition, Warszawa 2010. 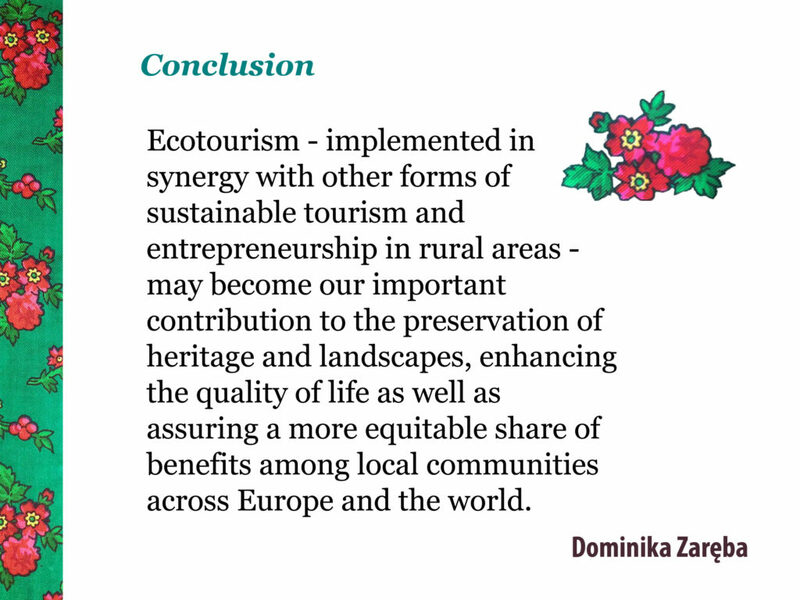 Zaręba Dominika, “Ecotourism development in Poland – best practices”, in: “Ecotourism facing global challenges”, 3rd European Ecotourism Conference, Społeczny Instytut Ekologiczny, Warszawa, 2015.